Located immediately east of New York City, Long Island (pronounced “Lawng Eyeland”) is the easternmost land mass in New York State. While known as Long Island, it is technically a peninsula (a running joke, particularly among out of state college students) as it is surrounded by water on three sides. Often when I tell people that I am from Long Island, their usual response (particularly among firefighters) is “hey do you happen to know Joe So & So, oh geez, what’s the name of that dept. he was with?” to which my response is “No, Long Island is not really an island - there’s over 2 million people who live there”. Most people envision Long Island as this tiny little community where everyone knows everyone - kinda like Gilligan’s Island only with paved roads!! There are still small communities on the East End as well as on Fire Island (a real island separated from the mainland) where people do know everyone but that is not typical. 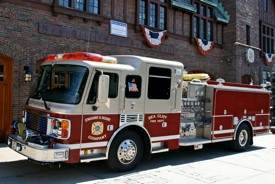 With regard to the fire service on Long Island, all Fire, Rescue & EMS is provided by volunteer departments with a proud history dating as far back as the 1800’s (the oldest fire department in New York State, Sag Harbor FD at 200+ years old is located in Suffolk County). Long Island’s volunteers are known as active, well funded & highly trained employing aggressive tactics in firefighting, technical rescue & EMS. Many career members of the FDNY & NYPD are among Long Island’s volunteers with their hometown departments, often serving as command officers bringing an even higher level of experience & training to their respective departments. The demographics of the Long Island fire service vary greatly with regard to each department’s manpower levels, apparatus fleet and number of responses. Departments range from those handling 200 alarms a year operating from one station with a few apparatus protecting a rural community on the East End to those with multiple stations, large apparatus fleets & 100+ active members answering over 3,000 alarms annually. Target hazards fit every conceivable category ranging from typical two story frame homes to large estates, commercial properties, industrial manufacturing facilities, miles of beachfront (water/ice rescue is a large part of LI’s technical rescue responses), large areas of preserved open space (creating the potential for wildfires), several regional airports, a military air base, national research laboratory and numerous nationally registered historical landmarks throughout Long Island’s communities. 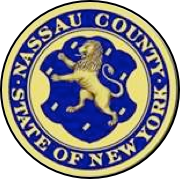 Bordering the New York City Borough of Queens to the east, Nassau County is commonly referred as “the sixth borough of NYC”. Seventy one fire departments (69 volunteer, 2 combination) along with six volunteer ambulance corps provide Fire, Technical Rescue & EMS services to 1.3 million residents (the Nassau County Police Emergency Ambulance Bureau also supports the fire service with ALS ambulances operating on roving patrol from each precinct). Target hazards range include residential homes, large estates, commercial properties ranging from “downtown” areas to large shopping malls, mid-rise hotel & office buildings as well as the Nassau Veterans Memorial Coliseum, home of the Islanders hockey & New York Dragons arena football teams. 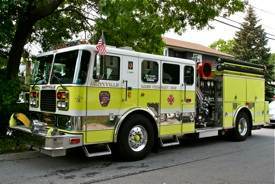 The departments range in size from just two engines covering a mere 13 square blocks to over 20 square miles with multiple stations, large apparatus fleets and 200+ members. 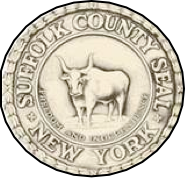 The larger of the two counties on Long Island, Suffolk County covers roughly 1,000 square miles (86 miles long x 26 miles at it’s widest point) and is the easternmost county in New York State. Home to over 1.4 million residents, it is primarily a suburban residential community with farmland and large areas of preserved open space on the East End including the Pine Barrens region (the site of the 1995 Sunrise Wildfires, the second largest fire in New York State history). Other notable areas include the Fire Island National Seashore (a primarily seasonal community separated from the mainland) as well as the famed Hamptons. 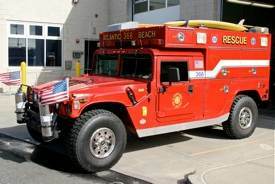 A total of 110 fire departments (106 volunteer & 4 career including Brookhaven National Laboratory, LI MacArthur Airport ARFF, Gabreski Air National Guard base & the Northport VA Hospital) and 27 volunteer ambulance corps provide Fire, Technical Rescue & EMS services with over 10,000 active volunteers serving their communities. 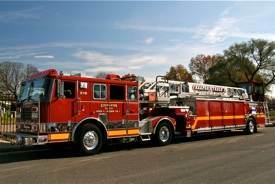 Comparable to Nassau County, these departments range from those with one station and several apparatus to many with over 100 members responding from multiple stations with large fleets of apparatus answering in some cases in excess of 3,000 alarms annually per department. Target hazards are consistent with Nassau County as well as the above mentioned national laboratory & airports. 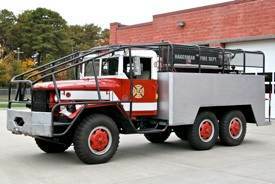 Due to the many preserved open spaces, a specific hazard encountered in Suffolk County is brush fires necessitating the need for “stumpjumpers”, a locally built variation of the “brush breakers” common in Massachusetts that penetrate deep into the woods to access the “seat” of the fire. 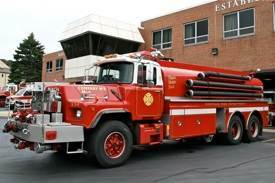 In addition, due to the rural nature of many communities on the East End, this necessitates the use of tankers for water supply & four wheel drive equipped apparatus for beachfront access.